Crafted with a classic structure and contemporary flair, innovative Richmond Collection picnic tables help establish an appealing seating area. 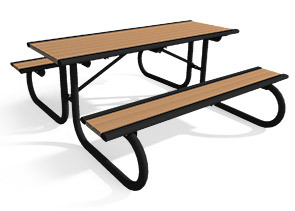 These eye-catching picnic tables feature recycled plastic planks integrated with oval-shaped steel tube end-caps supported by a 2-3/8"O.D. 'J-leg' steel frame. Engineered to withstand years of exposure to direct sunlight, wind, rain and snow. The 2" x 4" recycled plastic planks are premium grade and will not fade, warp or peel, while all the steel components are sealed with an ultra-resilient powder-coating finish. Create a cohesive setting with the Richmond Recycled Collection offering matching park benches, trash receptacles and multi-pedestal tables.